Nickname: "Obersten" (Colonel), "Nordens Italiener"
The great Norway side of the late 1930s had many excellent players, but Arne Brustad was probably the best of the bunch. 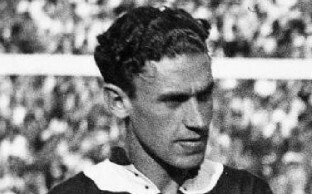 The outside-left from Lyn made his international debut against Hungary's amateur side in 1935, and also played in the game against Denmark later that year, but was subsequently dropped. He returned to the side the next year, just in time for the Olympic Games in Berlin. It was at this tournament Brustad would make his name as one of Norway's greatest footballers of all time. Norway's first match of the tournament was against Turkey, where they won 4-0 and Brustad scored the final goal. The next match was one of Norway's greatest performances ever. In front of a capacity crowd, including Adolf Hitler and Joseph Goebbels, at the Olympic Stadium, Norway shocked the hosts, winning 2-0 thanks to two goals from Magnar Isaksen, and Norway - not Germany - were through to the semi-finals. Norway eventually lost the game against eventual champions Italy 2-1 after extra time, with Brustad scoring Norway's goal, which meant Norway would now face Poland in the bronze match. This match would be Brustad's finest moment to date. He scored all three goals as Norway beat the Poles by a score of 3-2 and won bronze at the tournament. Brustad was hailed by the press, both in Norway and abroad, as one of the outstanding players of the tournament. One can only speculate how much he would be worth if he had been born 60 years later. But Brustad was not done yet. In 1937, Norway defeated Ireland to qualify for next summer's World Cup in France, and Brustad would get another chance to shine at a major international tournament. Once again, Norway had to face the Italians - the great Italian side that had won the World Cup four years earlier and included great players like Giuseppe Meazza and Silvio Piola, who were among the best players in the world at the time. Like the Olympic tournament two years before, this game would need extra time to determine the winner. Italy took an early lead through Pietro Ferraris, but Norway dominated the game from then on, with goalkeeper Aldo Olivieri saving his side on more than one occation. Then, in the 83rd minute, Norway were finally rewarded for their pressure. Brustad dribbled half the lenght of the pitch to equalise. Minutes later, Brustad looked to have scored his second, but the goal was wrongly disallowed for offside - something even the Italians admitted after the game. And so, the game went to extra time, where Piola scored the winning goal four minutes into the extra period. Italy had once again come out on top against Norway, and would eventually go on to win the tournament. For Norway, it would be another 58 years before their next appearance at the World Cup finals. When the Nazis invaded Norway in 1940, it brought an end to all organized football activities in the country for the next five years, and when Norway played its first post-war international against Denmark in 1945, it became painfully clear that Brustad, like most of the other "bronze age" heroes, was no longer the player he used to be. It became even more clear later that year, when Sweden, who had not been involved in the war, demolished Norway by a score of 10-0. Brustad, now 34, would get one final match for the national team at Ullevaal in the summer of 1946, possibly as a way of getting a farewell match in front of the home crowd. He finished his international career with 33 caps and 17 goals - a substantial number at the time, and he would probably have gotten many more if not for the war. At club level, Brustad spent his entire career at Lyn, and won the Cup in 1945 and 1946. He passed away in 1987.